I had something that I wanted to write about today but it is going to take longer than I have! 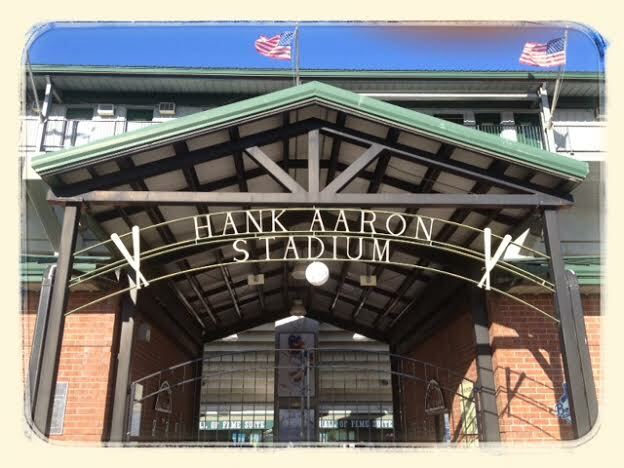 I went to Hank Aaron Stadium, which was right off Satchel Page Drive in Mobile, Alabama, last night to see the Bay Bears play the Mississippi Braves. The two Braves pitchers were on fire and only allowed one hit and no runs beating the Bay Bears, 2-0. I enjoyed the game and I liked how the stadium was laid out. They had all the luxury boxes on the field level and the stands above it. It was an older stadium but it seemed clean and well taken care of. There was not a lot of people in the stands since it was a mid-week game. However, I did get two balls. I chased after the one and found the other one right next to it, it was labeled “Minor League Practice Ball” – hey I will take it! Makes for a good story! I also read in Zack’s book that a batter at times will tap his helmet twice to let the second base umpire know he is in his sight line. The umpire will then re-position himself. I finally learned how they calculated On-Base Percentage (OBP) and Slugging Percentage (SLG). We all have seen them on the scoreboard but did you really know what they meant or how they came up with the percentage. I have been around baseball for a long time and all I knew was, the higher the better! This is where I start feeling like a fraud, I need Eggo again! Therefore, here goes the formula for “On Base Percentage”: “Add the player’s hits, walks, and times hit by a pitch. Write that number and keep it separate. Now figure out a second number by adding his at-bats, walks, times hit by a pitch, and sacrifice files. Write this new number after the first number and stick a division sign in the middle. That’ll give you his on-base percentage. (Anything above .400 is fantastic.) Here’s the formula: (H+BB+HP) / (AB+BB+HP+SF).” Joey Votto, first baseman for the Cincinnati Reds. is the current active MLB leader in OBP, with a career mark of .4193, so that means he gets on base almost 42% of the time! Slugging Percentage (SLG) is a little easier to understand. Divide the players total bases by his at-bats is all you have to do. “Total bases are the number of bases resulting in hits; a single is one base, a double is two, and so on. The simple formula is TB/AB, but first you might have to some arithmetic to figure out the number of total bases.” Anybody that is above a .500 slugging percentage is good, .550 is great, and above .600 is extraordinary, since only a few do it each season. As of today, the Colorado Rockies as a team has a .506 slugging percentage, which is very good! They hit just as many extra base hits as they do singles. I love Zack’s book and I highly recommend it. I hoped you enjoyed a few of the nuggets I pulled out of it. If you want to order one, click – Watching Baseball Smarter. I don’t get any royalties so I have no ulterior motive. I am also reading some historical books on the integration of baseball in the south, Mr. Willie really got me interested. I love that I learning all of this!